Get out of Debt Today! 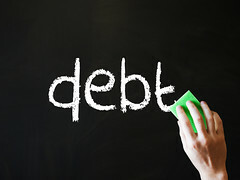 Runaway debt can seem to strangle you. You feel like you are sinking into a bottomless pit. You can’t think. It even seems hard to breath, so you react. Unfortunately, some of those reactions only make matters worse. Here are three debt strategies that you should avoid at all costs when becoming debt free is your main priority. Making minimum payments may seem to make sense for the short term. The problem is that you are not reducing the total debt in a noticeable way. If your balance is high enough, the monthly interest could actually be more than your minimum payment. Turning to new loans with higher interest rates in order to pay old debts. One payment may sound easier to manage, but you have just added to the debt and extended the payment terms. How long before that loan gets out of hand? Borrowing from friends and family may offer immediate help, but what happens if you can not repay the loans? The most common outcome of borrowing from friends and family is that you create hard feelings, lose friends, and have trouble being around family members. As you look for ways to survive the debt storm, do not be afraid to ask for help, not money. Talk to your parents, they probably had similar troubles at some point. Talk to professional debt counselors, but never use the services of a company that requires upfront money. As you work your way through it, remember that you are not alone and it will get better if you use the right strategies.